Germany’s critics have a point: Angela Merkel doesn’t get it. Ever since the beginning of the euro crisis, the German chancellor has refused to acknowledge that something has to change at home if debt-challenged euro members are to respond to Berlin’s demands that they become more competitive. In plain words, Germany has to welcome somewhat higher inflation, address its own economic bottlenecks and import more from the rest of Europe, thus reducing its current account deficit. So far the calls have been ignored. Germany hasn’t been convinced to change a policy that has done wonders for its people, at least for now. Angela Merkel could even argue that the problem, if there was one, is no more. Her country’s surplus with the rest of the euro zone has disappeared, in part because the austerity-induced recession has shrunk imports in deficit-ridden members, in part because of improved competitiveness and rising exports in countries like Spain. The euro zone as a whole is now running a current account surplus with the rest of the world of about 2.3 percent of 2013 GDP. Germany can also point out that its economy has grown faster than the euro zone average since 2010. Furthermore, as an aging country, it is in its national interest to save more than it invests. What Merkel won’t say too publicly is that she is worried about the economic stagnation and political stasis in France, its biggest partner. Taking on the responsibility, and domestic political pain, of pulling the euro zone out of the slump isn’t worth the effort if France falls from the wagon. As yet, no one has offered Germany a politically viable roadmap to rebalance the euro zone that would address those concerns. A deal between Europe’s two main powers could be a good start: French reforms against German growth. Not easy, but do-able – and worth it. 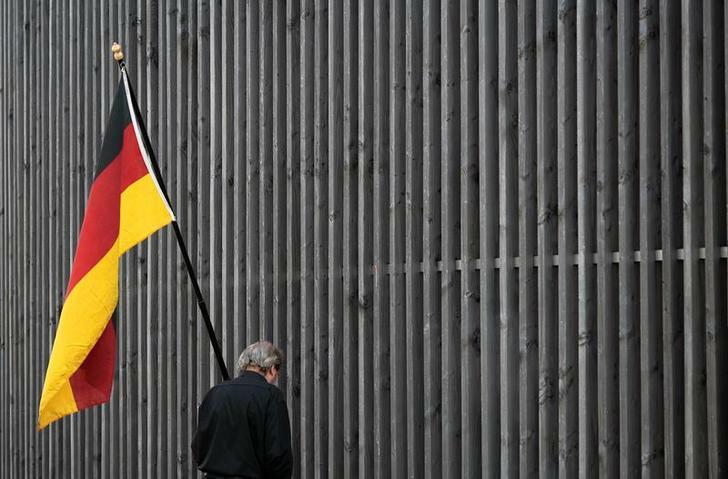 Former East German Eckard Wolfermann from Berlin, holds a German flag near the Berlin Wall memorial at Bernauer Strasse in Berlin.